At Gembrook we inoculate tree seedlings with DNA tested inoculum using expert methods developed and perfected in house over many years. The inoculation procedure is conducted as a sterile laboratory process soon after germination. Sterile media, containers and environmental conditions are absolutely essential to ensure invading, strongly competitive soil borne fungi such as Scleroderma and Hebeloma are excluded. DNA testing of the inoculum is carried out by external certified laboratories as part of our quality assurance regime to avoid contamination from species such as T. brumale and T. indicum. Every effort is made to ensure a high level of colonisation with the desired truffle species. The seedlings are planted in tree tubes and grown on in a multi-span greenhouse for approximately eighteen months. 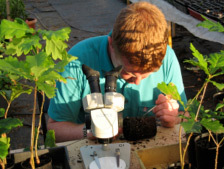 Periodic microscopic sampling is carried out to check for truffle colonisation. Finally as part of the selection process, seedlings are checked before being released for despatch. The Australian Truffle Growers Association (ATGA) conducts a certification/evaluation program to verify the truffle inoculated seedlings are adequately colonised with the desired truffle species. Certification is available (at additional cost) through Trufficulture and is performed by an independent laboratory. The evaluation comprises of comprehensive destructive examination of a statistical sample from a batch of trees for overall seedling health, root colonisation levels with desired truffle species, followed by DNA analysis to confirm the seedlings are free from other truffle contaminants. All truffle inoculated trees are grown to order and need to be forward ordered. Large orders need to be placed at least twelve months prior to delivery to be scheduled in the production plan. Orders are secured with a 25% deposit paid at the time of ordering. Some stock is available for adhoc /retail sales without having to place a pre-order. These are best suited to gifts and hobby scale plantings and is limited to order quantities of up to 10 plants. See this link to a free planting guide (pdf) which includes a suggestion for liming your soil.